A great smile can light up a room, and an essential part of a great smile (or an attractive pout) is full, well-shaped lips. Some people are born with thin, long, or otherwise disproportionate lips. These conditions may also occur with age. If this is the case for you and you’re unhappy with the way your lips look, it may be time to consider lip enhancement from Charlotte, NC facial plastic surgeon Dr. Sean Freeman. Patients who choose Dr. Freeman at The Center for Facial Plastic and Laser Surgery are choosing a physician who has specialized in lasers and facial cosmetic surgery since 1988. Our motto is “Only Faces, Only the Best Care.” To learn how Dr. Freeman delivers high quality care for his lip enhancement patients, you can request your consultation online to receive $25 off your consultation fee or call Dr. Freeman’s office at (704) 543-1110. Lip augmentation can be safely accomplished using injectable fillers or surgical implants. There are many types of implants for lips; Dr Freeman’s years of experience have led him to recommend implantable dermis as the safest implant. The choice of using one approach or the other depends on the goals of the patient. During your consultation, Dr. Freeman will review the pros and cons of each method and help you decide which is best for you. Surgeons specializing in plastic and reconstructive surgery began using dermis many years ago, mainly for reconstructive purposes. Today, more than 40,000 patients around the nation have received dermal allografts. Dr. Freeman has found that a dermal allograft is the best material for surgical lip augmentation because it gives lips a soft, natural look. An allograft is any human tissue that is transplanted from one person to another. Allograft tissues have been used for many years in millions of surgical procedures. Dr. Freeman receives dermal allografts from specialized sources within the U.S. where cells are removed from donated allograft skin, leaving only the collagen scaffold of the dermis. The corporations that provide allograft dermis are regulated by the U.S. Food and Drug Administration (FDA). Tissue banks throughout the United States surgically remove skin from donors using sterile operating room techniques. Before donated skin can be processed, the tissue donors undergo rigorous screening by the tissue bank. This type of surgery is usually performed in an office operating-room environment, and most patients return to work in a several days. Allograft dermis is used under the surface of the skin to enhance soft tissue. Allograft dermis can be folded, rolled or stacked to provide the amount of enhancement needed. When transplanted to a patient, the allograft dermis gradually becomes a natural part of the patient’s own tissue and performs like normal, healthy tissue thereafter. That is what makes it so effective for lip augmentation. 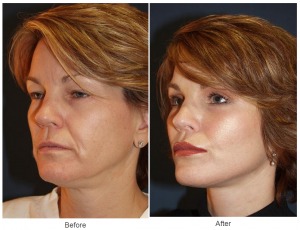 View some Before and After Photos of Lip Augmentation here.